Installing Homebew (often referred to as brew) is outside scope, so please refer to their documentation. Where will FreeBSD be installed? Into a file-based filesystem. Yes, we will create a file and FreeBSD will be installed into that. In the bhyve documentation, this is referred to as the virtual disk. I wanted a 50G drive. I will be installing a copy of the FreshPorts database within this FreeBSD instance. 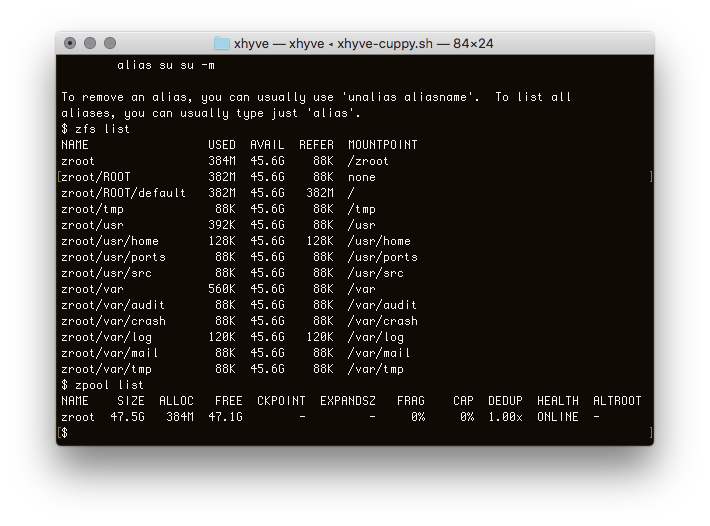 I have, just now, considered running PostgreSQL natively on OSX itself. I would prefer to keep everything within FreeBSD if I can. I am putting all my xhyve work in ~/xhyve, but your choice should suit whatever you want to choose. You don’t have to create an install script, but it makes it easier than typing everything into one command. 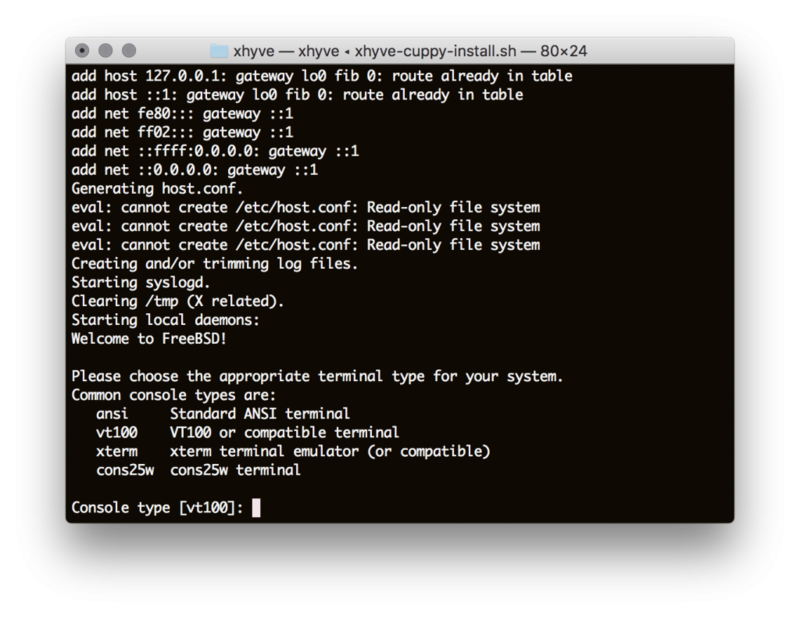 This is xhyve-cuppy-install.sh, based upon what I found in the xhyve tutorial mentioned above. These are my notes on the above, and I’m not 100% positive that my descriptions are correct. Line 5 – USERBOOT points to the userboot.so file supplied by your xhyve installation. It may vary from what I have. Line 6 – BOOTVOLUME indicates the image we will boot from. In this case, it is the FreeBSD install image. Line 8 – IMG – the virtual disk we will install into. This is what I created using mkfile above. IMG is used within the IMG_HDD parameter (see below). Line 11 – MEM – this system will have 2GB of RAM. Line 12 – SMP – this system will have two CPUs. Line 15 – IMG_CD – The image to be presented as a CD. Line 16 – IMG_HDD – The definition of the hard drive image of the virtual disk. I do not know why both IMG_CD and USERBOOT both need to be specified. 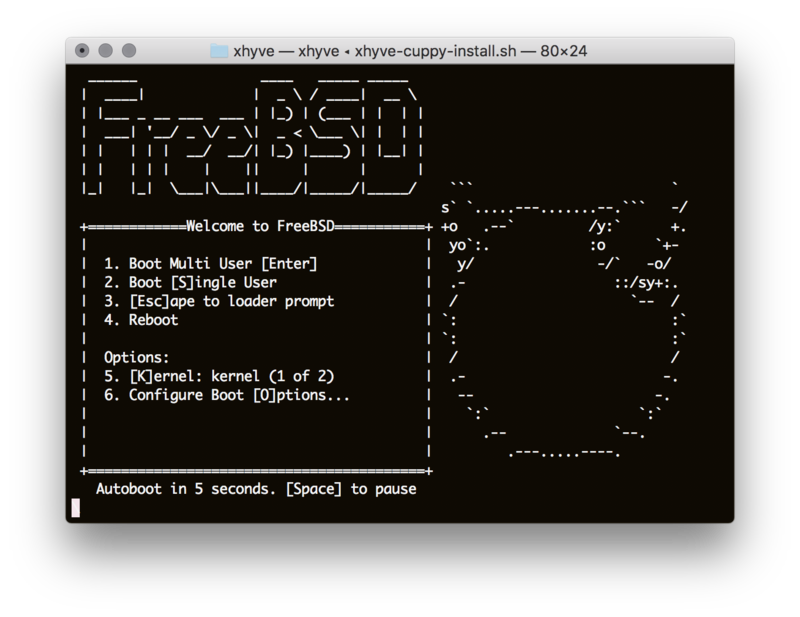 When I run this script, I am immediately presented with the FreeBSD splash screen. Shortly thereafter, you should get to select the console type. I pressed ENTER. 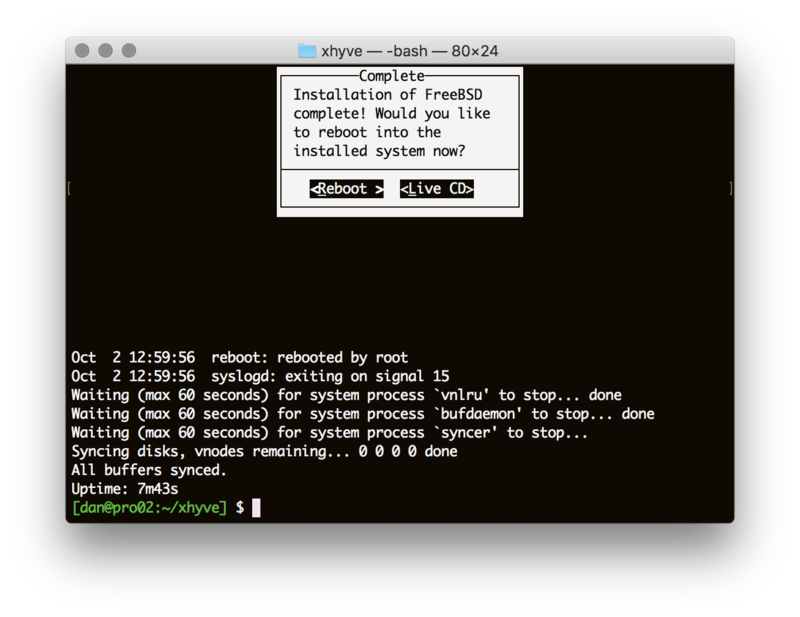 Now you can begin the FreeBSD Install process. Details of this step are outside scope of this post. To create the run script, I copied the install script and modified it slightly. As you can see, I moved IMG up above BOOTVOLUME. If you have more insight into the parameters for the scripts, please let me know and I will update this post. Now I have to install jails and get this instance up to speed.